Blame Gloria is the newest addition to Adventure Bars, the gang who watch over Napoleon’s party island of Bar Elba, the pink paradise of Tonight Josephine, and now the most glam rock venue in Covent Garden. They say Gloria made the best whiskey sours, was the the first to put makeup on Bowie’s face, and even dated Jimi Hendrix. She moved into the basement when she ran out of cash, but still throws the wildest get-togethers. We took it upon ourselves to put on our dancing shoes, and meet the new girl in town. The TVs in the hallway gave people plenty of Insta-moments. 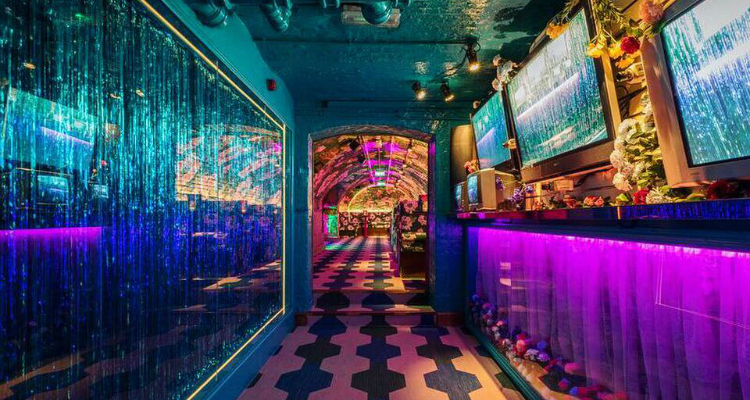 Upon entry, it was clear the party was always in full swing, with the flower power decor, glitter-covered walls and televisions running from the main bar to the plush velvet booths, there were even disco balls in the toilet cubicles. It was a Friday night, slightly after happy hour, and the space was filled with an end-of-week celebratory atmosphere as 30-somethings danced to the music and sang along to the eclectic soundtrack. Everyone made an appearance, from The Kinks to Scissor Sisters, even Smash Mouth, paying homage to the glam rock glory days while welcoming in the fresher faces. The cool booths in which we were sat had an exclusive feel to them. It wasn’t just the music that harked back to the icons, my affinity to Bowie led to my ordering of a Ziggy’s Stardust (£10.20). The drink was sharp, sweet and punchy, much like the man himself. The Midnight Flower (£10.20), named after the song by Four Tops, had a lovely delicacy to its flavour, as soft floral notes came through with a sprig of rosemary and a wildflower to garnish. Another cocktail that blew my socks off was the gorgeous Love Potion No.10 (£10.80) which had multiple layers of deliciousness to it, the sugared rim of the glass provided an instant sweetness which complemented the sharp taste of prosecco and pineapple syrup. 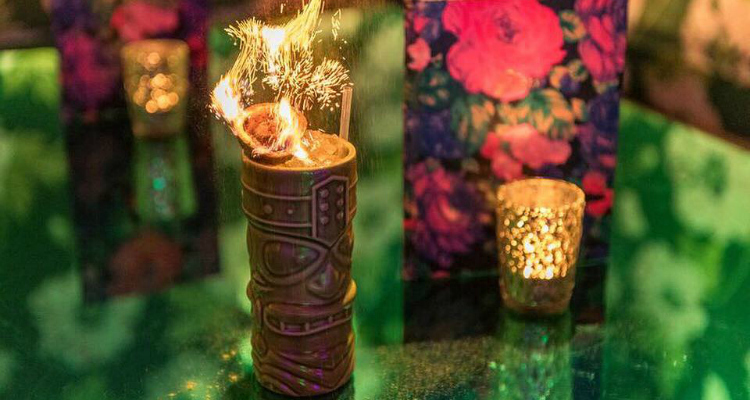 Then of course we had to try the deadly-sounding Flaming Zombie (£11.50), a concoction made of three different types of rum set alight and served in a tiki cup. It was as we finished these, and as ‘Backstreet's Back’ started playing, that we decided to make our exit which I thought was a pretty good way to go. The Flaming Zombies are one hell of a drink. Blame Gloria has a fun, fierce and free feel to it. 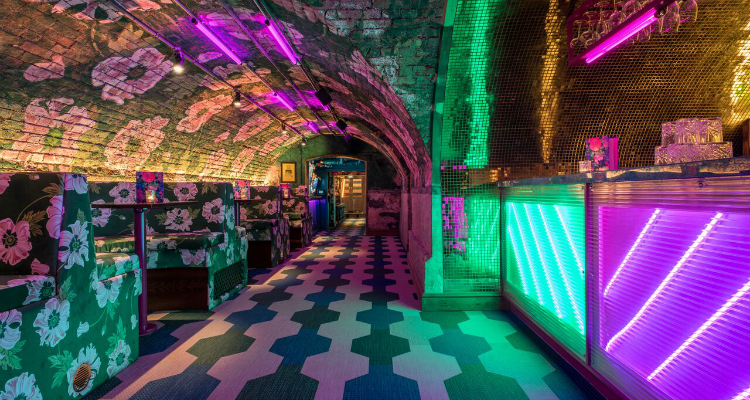 Its delicious cocktails and retro glam decor create a real party vibe we can all get on board with. I don’t know who Gloria is, but I wish I did, she’s got style.